On April 27 2010, our precious son and brother, Brayen Gene came into this world. Little did we know what the future held for us and how short of a time we would have with him. When Brayden was eight days old, it was confirmed through the Newborn Screening in the state of Michigan that Brayden had Methylmalonic Acidemia. Our minds raced as we knew absolutely nothing about this condition or what it meant for our son. The weeks after were a blur as we learned to care for Brayden. Brayden may have had a rare condition and specials needs, but he was perfect to us. 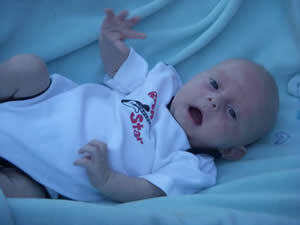 On July 31, 2010, Brayden grew his Angel wings. Brayden is missed deeply everyday by his family that loved him unconditionally and not a day goes by we don't think and talk about our precious baby.